"We Carry SCREENEZE™, The Latest Technology In Porch Screening"
The World's Most Innovative Porch Screening System ! The Easiest Porch Screen System To Install ! 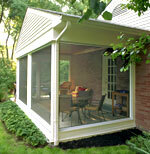 The Cost Effective Way To Screen Any Porch Or Sunroom ! SCREENEZE™ porch screens are the perfect solution. Our porch screening system will compliment any existing decor and provide complete protection against flying insects and other airborne pests. The sun-control fabrics also provide a great solution to help reduce the fading of interior furnishings while filtering out uncomfortable heat and glare. Whether for insect or solar control, we have the answers that offer you a view to the outside. All of our porch screening is made to stand the test of time. This product is made using only the finest materials for the best fit and finish in the industry. The aluminum extruded frame is powder coated and finish trim pieces are matching PVC producing the best appearance possible with a long-lasting, easy to clean surface and the screen is made to do what screens are intended to do.... keep bugs out. We have also made installation and maintenance easy. Our systems are designed to fit any size porch opening and are adaptable to any custom size in mere moments. They are easy to use and install regardless of application. If the screen is accidentally dented it will return to is original shape in less that 72 hours. Our porch screens are versatile and designed to be installed in several ways that allow their frame and appearance to disappear. They are unobtrusive, easy to use and install very quickly. 10 year limited warranty on the aluminum channel & vinyl cap. 1 year limited warranty on the screen. Different from all other porch screening systems with no splines to roll and no staples. 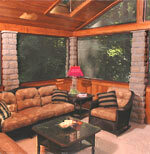 The SCREENEZE system stretches the screen for you and can exceed current standards for screen porch openings. SCREENEZE surpasses all fixed screen porch systems. A unique porch screen system that is small and specifically designed to rest on the surface or in the recess area of any porch opening. The aluminum base and a vinyl cap can be installed on the inside, outside, or center of your porch post and rail system. Available in White, Sand, and Bronze/Black in 8 foot sections. 12 foot sections can be ordered in larger quantities. Powder Coated aluminum cahnnel with matching vinyl cap for a better, long lasting appearance. Shipped in a tube an eight foot piece includes the aluminum base, a vinyl cap, and 10 color-coordinated screws. You will also receive a brochure and assembly instructions. A very user friendly screen system. Any individual with minimal carpentry skills should be able to install this porch screening. No special tools are required. Click here to download the Porch Screen Installation Guide. Durable screening that protects from dirt, ultra violet light and inclement weather. No more removing and storing of screens in winter. This porch screen system does not limit you to forty square feet of screen or a width of three feet. We recommend a three foot ten inch wide by seven foot ten inch high panel for most screen porches. We have installed SCREENEZE in eleven foot eight inch wide by seven foot ten inch high openings. SCREENEZE is compatible with most screen fabrics. We recommend our fiber glass screen however, you can use aluminum screen, pet screen or solar screen. If you are interested in converting your screen porch into a three season room we recommend a product called Flex-O-Glass. We sell Charcoal Colored Screen (#1816, #1816) in a variety of widths, and you can specify any length in addition to our 100 foot rolls. Gray Colored or aluminum screen avaiable upon request. 36" to 72" fabric widths are an 18 x 16 per square inch mesh with a .011" fiber diameter. 96" fabric widths are an 18 x 14 per square inch mesh with a .013" fiber diameter. Porch screens can be easily cut to fit and installed on site by an novice Do-It-Yourselfer. To order a pre-cut and partially assembled Porch Screen Kit please contact one of our customer service representatives at 1-855-568-8586. A SCREENEZE porch screen kit is the most practical and versatile system on the market today. Generally, the system is comprised of a screen material (normally fiberglass insect screening), an aluminum channel and the vinyl cap finsh trim. The aluminum channel is cut and attached with screws to perimeter of your proch openings. The screen is tensioned by snapping the vinyl cap trim over the screen placed on the aluminum channel bead. It automatically stretches the screen material to the proper tightness. What makes our product unique lies in the heart of each system; the vinyl cap, aluminum channel and the screen. All are engineered to perfection. The design of the extruded vinyl cap and aluminum channel is based on years of experience. The fiberglass screen is specifically engineered for use in our screen systems and is the result of several years of development by one of the world's largest weavers of insect screening. They are tough and designed to expand upon impact or accidental bumps...then return to normal position. This will prevent costly repairs and provide lasting use.